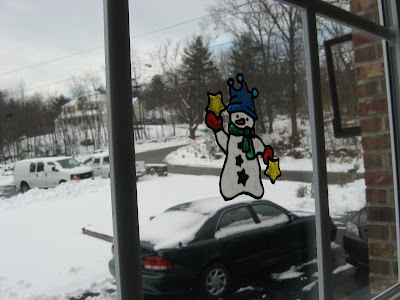 Hooked on Needles: Klutz Window Art ~ a Fun Diversion from Needlework! 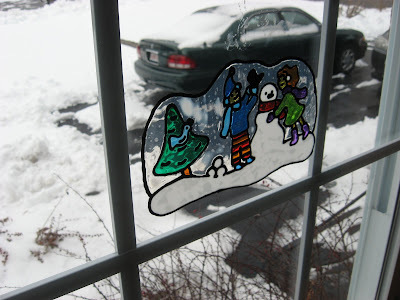 Klutz Window Art ~ a Fun Diversion from Needlework! Do you find that most people who are creative in one area are also creative in others as well? Do you enjoy more than one form of artsy, crafty, creative activity? Of course you know what I enjoy: anything with fabric, anything with yarn, lots of things with paper. Well I can now add something new to the list thanks to the Christmas gift that our oldest daughter, Elizabeth, gave to our two younger children, Sean and Grace. Have you heard of Klutz Books? You might think of them as making crafty things for young kids. This product that we just tried for the first time is called Window Art. Sean and Grace just love it. And let me tell you, once you try it, no matter what your age is, you'll be hooked too! This is from the Christmas Window Art book that was the gift we received for Christmas, along with the deluxe refill pack so we would have lots of colors to choose from and be able to make lots of fun things. 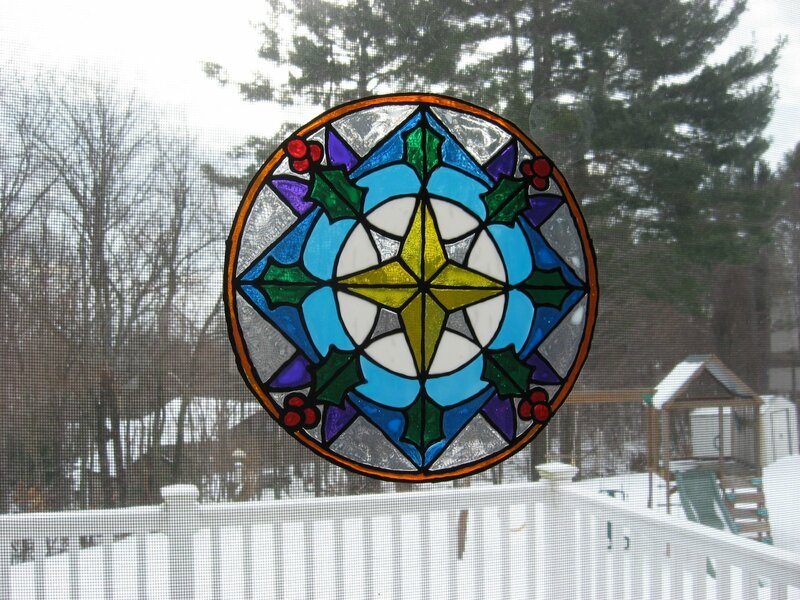 Elizabeth did this one and it looks like a perfect piece of stained glass stuck to our slider! This cheerful snowman looks like he's standing on top of our car! Elizabeth did this one too. Hmmm, now that I think of it, I wonder if she really did get this for the kids! And it looks like we have a couple of fun-loving kids building a snowman in the driveway! Guess who did this one...yup, Elizabeth! She spent some time here the other day and just couldn't get enough of this stuff! 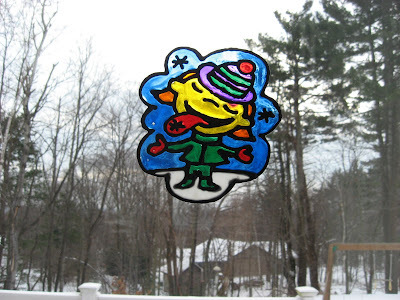 This is one that Sean did...a cute little girl all dressed in green catching snowflakes on her tongue! 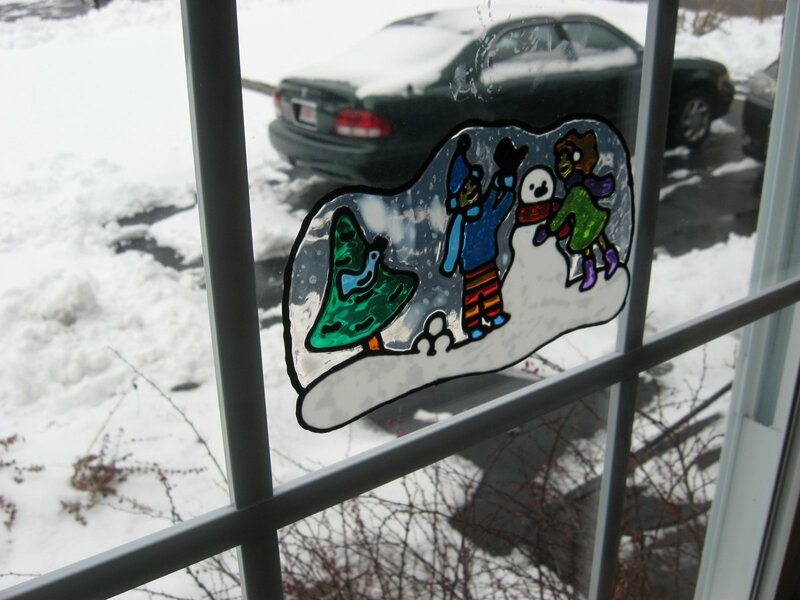 We all made lots of Christmas-specific window art as well, but all of that has since been put safely away until next Christmas. I only left out the winter scenes, and that awesome stained glass star piece which happens to have holly on it. I guess that can be considered winter-like too! These pieces are hard to photograph well to show off how bright and clear they really are. But if you imagine stained glass with the sun shining through it, that is how they turn out. And they stick to windows, mirrors, the refrigerator, any shiny surface. You can check these books and the refill kit out at craft stores like Michael's or similar stores, but you'll find them for a lot less money on Amazon. Here are links to the books and the refill kit in case you think you might want to try this fun craft too! I'd love to know if you give this a try, and see pictures of your creations too. We have another birthday coming up in our house soon, and I have a feeling Elizabeth just might show up with one of the every-day window art books, for the kids of course! This sounds so neat - bet my grandsons would love this. I can remember my kids making these many years ago, and giving them as Christmas gifts. They had a lot of fun. Sounds like you guys did, too. 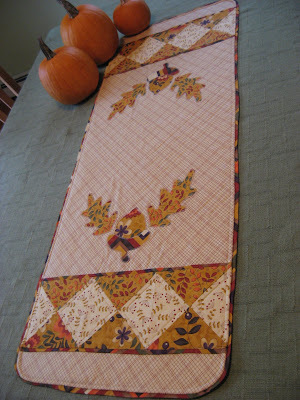 Piecing a Quilt Backing ~ Do you? Butterfly Garden Quilt Top ~ Complete! 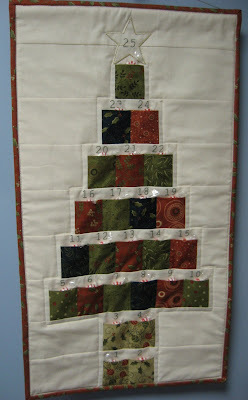 Karen's Postage Stamp Quilt ~ Backing is Pieced!